A Prom like No Other!! Many people ask “How can we show at-risk youth that we care” or “What can we do to help the residents of Youth Haven”? WELL Now Is Your Chance to get involved!! 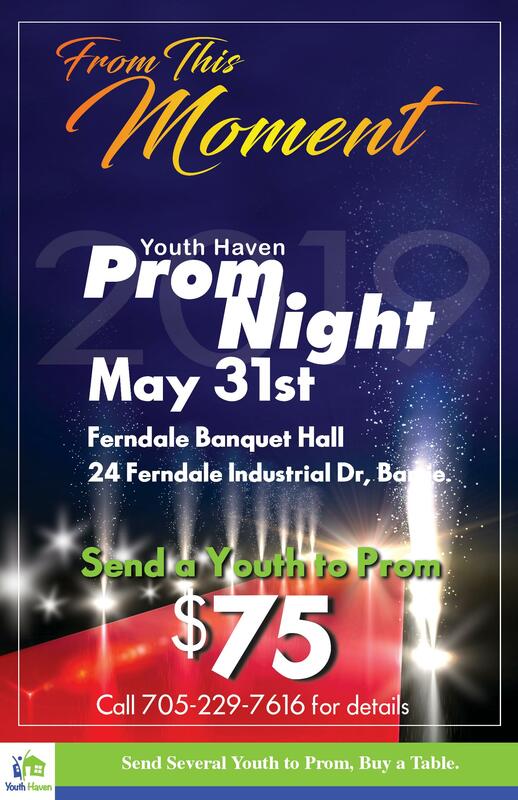 Youth Haven is hosting its First Annual Prom Night themed “From This Moment” and it will be a night that our youth will never forget. Many of our youth were unable to attend a prom, either because they weren’t able to finish school or never had the opportunity to attend school at all. When you don’t have a permanent place to live the last thing you often think about is school and even less important is attending a prom. That doesn’t stop them from dreaming of attending a Gala or Prom, so we decided to bring those dreams to life. We will have amazing speakers to encourage them to never give up, music to entertain them, hairstylists and makeup artists to glam them up and photographers to show them how amazing they look. You can also sponsor the event! In-Kind Sponsor – Door Prizes, Swag Bags, etc. Call Mary-Ellen (Director of Fund Development) for details (705) 229-7616. Purchase individual tickets for $75 each, or a table of 8 for $550 (a $50 saving).